NEW YORK, NY -- April 22, 2013 – Meredith Corporation (NYSE:MDP; http://www.meredith.com), the nation’s leading media and marketing company serving 100 million American women, and Driver Digital (http://www.driverdigital.com), one of the premiere online video media companies for women, kids and tweens, have partnered to provide Meredith’s more than 40 million monthly site visitors with premium, original content videos. Driver Digital’s top online video series from its Just Her Network targets Meredith’s core pillars: Food, Home, Moms and Lifestyle and will begin to be syndicated across Meredith’s 14 premium websites, including BHG.com and Parents.com. Driver Digital’s wildly successful video series Project Nursery, The Recipe Box, Baby Names, Growing Wisdom and FullyRaw Kristina have generated more than 6.5 million views on YouTube and respective sites/blogs, as well as very loyal fan bases. This syndication deal is part of Meredith Digital’s commitment to deliver more than 2,000 original videos to its users in 2013, complementing its existing library of over 7,000 videos. Meredith’s branded digital video portfolio currently garners over 15 million views each month (Source: Omniture 2013). Driver Digital’s video content speaks to Meredith Digital's ability to inspire millions of women to live their dreams – as well as everyday life in between – via brand extensions across multiple devices and screens including mobile, social, web and tablet. Meredith Digital brands currently rank #1 in food and #2 in lifestyle, according to comScore (October - December 2012). 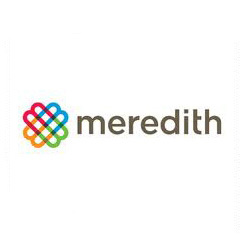 Meredith Corporation is the leading media and marketing company serving American women. Meredith reaches 100 million American women every month through multiple well-known national brands – including Better Homes and Gardens, Parents, Family Circle, Allrecipes.com, Ladies' Home Journal, Fitness, More, American Baby, EveryDay with Rachael Ray and FamilyFun – and local television brands in fast-growing markets. Meredith is the industry leader in creating content in key consumer interest areas such as home, family, food, health and wellness and self-development. Meredith uses multiple distribution platforms – including print, television, digital, mobile, tablets, and video – to give consumers content they desire and to deliver the messages of its advertising and marketing partners. Additionally, Meredith uses its many assets to create powerful custom marketing solutions for many of the nation's top brands and companies. Meredith Xcelerated Marketing has significantly added to its capabilities in recent years through the acquisition of cutting-edge companies in digital, mobile, social, healthcare, database, and international marketing. Driver Digital (http://www.driverdigital.com) is one of the premiere online video media companies for women, kids and tweens. By specializing in viewer acquisition and engagement (Watch Time) on YouTube, the open Web, social media and mobile/tablet platforms Driver Digital enables its networks of high-quality content to reach their maximum potential. Its Just Her and Driver Digital Kids networks are slated to deliver 4.2 Billion ad impressions over the next 12 months. Just Her is the fourth largest Female/Mom dedicated network on YouTube (according to current Nielsen rankings) and outperforms its larger competitors in virtually every engagement category. Among unique viewers, Just Her has grown from 600,000 unique views in 2011 to more than 11 Million unique views in December 2012 with more than 1.2 Million subscribers. Driver Digital Kids’ has approximately 2 Million subscribers, serving more than 10 Million unique views each month.